Boom Town BBQ owner Steven Gaausch (pronounced ‘gosh’) says he was “born into the food business.” Steven’s father and brother were executive chefs and while he was growing up they were always barbecuing something. As Steven got older, he began helping out with his father’s smoke trailer. After his father retired from the barbecue business in 1990, he bought the smoke trailer and began traveling the area feeding hungry patrons. Around October, the Gaausches opened Boom Town BBQ, located at 19600 S. 353rd W. Ave just north of Bristow, just off of Old Historic Route 66. While Steven cooks, his wife Shane and daughter Katlyn (also known as “squirrel” to friends and customers) perform the waitressing duties. Left to right: Katlyn, Steve and Shane Gaausch handle the cooking and waiting duties for Boom Town BBQ. Pulling up to the place, it reminded me of being back in yesteryear. The modest single-story building looks plain from the outside, but once you enter through the screened front door, it feels like you’re stepping back into the heyday of Route 66. There are no overwhelming decorations, just down-to-earth country decor. I asked Steven for a recommendation and he said a favorite of the regulars is the Boom Town Dinner, which is 7 meats, 2 sides, and toast ($14.99). Not being that ambitious, I settled for the 3-meat combo, which consisted of sliced brisket, bologna and smoked sausage, Bar-B-Q beans, potato salad and Texas toast ($13.49). I did not receive a pickle, pepper or onions with the meal, so you may have to inquire if you want it with your meal. Biting into the meats, you can taste the smoky flavor, which tickles your taste buds. Meals are served with a slightly tangy BBQ sauce already on the meats. Gaausch said the recipe for the BBQ sauce has been in the family for 35 years and was formulated by his father and then passed down through the years. I also enjoyed the Bar-B-Q beans, which had superb taste, and the potato salad was first class. 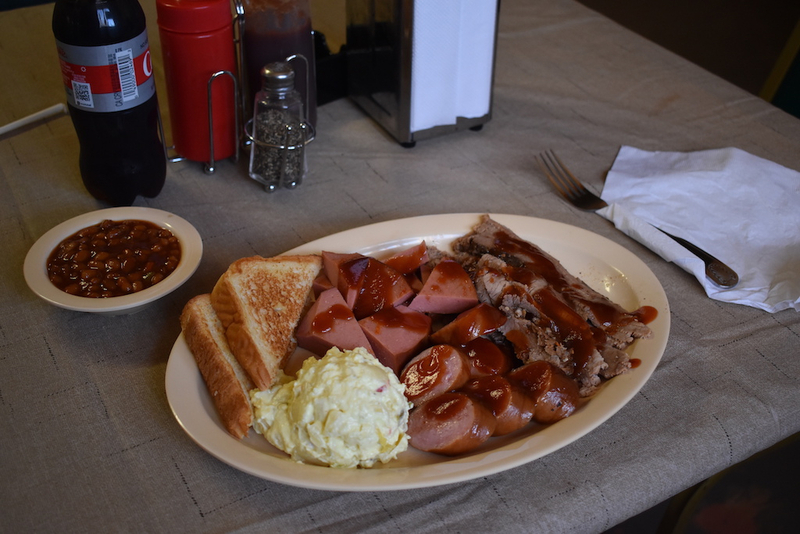 If you’re looking for some down-home-country barbecue, take the 20-minute drive from Sapulpa on Historic Route 66 to Boom Town BBQ. I’ve eaten barbecue in a lot of places, and in my opinion, this is up toward the top on my list for barbecue restaurants. Boom Town is open Tuesday through Saturday from 11am to 8pm and closed on Sunday and Monday. They are located 1-2 miles North of Bristow, on east side of the road just before 48/66 junction – it is visible from highway , but you have to turn on the old (original) Route 66 highway to get to it.